Kids have a night out to call their own! 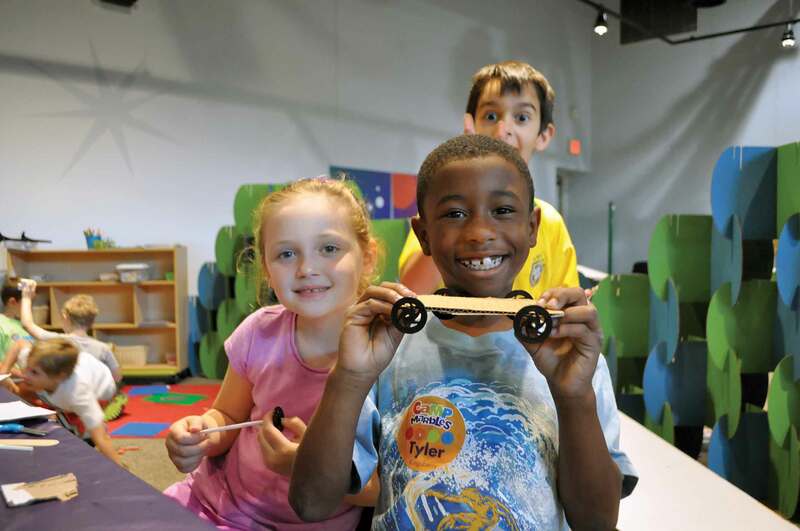 First Friday Kids Camp is a unique experience that includes museum play and making new friends, while exploring unique activities each month. Parents are free to experience downtown Raleigh's First Friday festivities, see an IMAX movie or simply relax while kids embark on their own adventure. Preschool (ages 3-5) and Elementary School (ages K5-10). All campers must be at least three years old and potty trained (no pull-ups). Dinner is not provided in First Friday Kids Camp. Campers are welcome to pack a dinner that they can eat during arrival time from 5:30-6pm. Those who choose not to bring dinner may start to play in the activity room next to the eating area. As campers finish eating, they will join in the play time until themed activities begin at 6pm. In consideration of children with allergies, please do not send any food containing nuts or peanut butter. All campers must be potty-trained (no pull-ups). All street parking in downtown Raleigh is free after 5pm unless posted otherwise. However, the lot located behind the museum is a 24-hour paid lot. Parents must provide a phone number where they or a designated emergency contact can be immediately reached during camp. This phone contact will be used in the event that a camper becomes sick or exhibits behavior that excessively disrupts the camp experience. In either instance, parents are expected to promptly return to pick up their child and no refund will be issued. All children must be picked up by 8:30pm. Marbles will assess a late pick-up fee of $1 per minute for every minute after 8:30pm until a child is picked up. (Example: If you are 15 minutes late, you will be charged an additional $15). Marbles Kids Museum reserves the right to charge this fee to the method of payment used for the event, or to collect late fees at pickup. Cancellations must be made at least two weeks in advance in order to receive a 50% refund.